PhilaFoodie will be on hiatus for about two weeks because I’ll be vacationing in Italy. Please note that any comments you post may not make it onto the site until I return. After the trip, I'll be posting reviews of some of the newest and hotest Philadelphia restaurants. In the meantime, please explore the PhilaFoodie Resources section on the right for the latest on what’s happening in the Philadelphia restaurant scene. You can’t really tell from this site, but I do enjoy beer. There was a time in my life when I was a serious microbrew disciple. I spent many-a-night in the early ‘90s tilting back bottles of pumpkin beer at the Squirrel Cage in Pittsburgh. Penn Brewery’s Mai Bock was the sweet nectar that nursed me back to health after a seemingly endless and crippling bout with (believe it or not) chicken pox the summer after my first year of law school. And shortly after it made its debut, I preached the virtues of the port-like Sam Adams Triple Bock to anyone who would listen. I did not make it to make it to the 17th Annual Beer Tasting with Michael Jackson at the University of Pennsylvania Museum of Archaeology and Anthropology last weekend. However, a good friend and fellow food blogger Mike at TVFoodFan.com did. When he offered to write a post about the event as a guest blogger for PhilaFoodie, I couldn’t refuse. After the jump, read Mike’s review of the event. When you're finished, check out TVFoodFan.com for the latest news and views about what’s going on in the world of culinary television. This past weekend saw the 17th Annual Beer Tasting with Michael Jackson at the University of Pennsylvania Museum of Archaeology and Anthropology. The event featured a guided tasting with beer expert Michael Jackson, a.k.a. The Beer Hunter, followed by a two-hour general tasting that offers beer from the Philadelphia area as well as from breweries around the world. This was my second year at the event, and this year's theme, Extreme Beer, provided a stronger roster of beers than last year's collection of beers brewed from various grains. The presence of Michael Jackson was again the double-edge sword of the event. He is undoubtedly a tremendous draw, and his introduction was smart, funny and insightful. The problem is that his presentation quickly devolves once the tasting starts and he gets into the intricacies of each of the beers. They tried to combat that this year, with the presence of Dogfish Head Craft Brewery founder and Extreme Brewing author Sam Calagione on the stage with Jackson. Calagione did an admirable job of moving the conversation along and trying to regain the crowd's attention from time to time, but it's almost a hopeless situation. The room is just too large and the sound system can't fill it enough to allow everyone to hear what is going on, and the crosstalk among attendees rises from a chatter to all-out conversation, drowning out the presentation. I was fortunate enough to be able to get a seat about twenty feet from the stage, so I got more out of it than most. The guided tasting beers were, for the most part, very good. The Hop 15 Double IPA from Port Brewing Company in San Marcos, California, was my big winner, while the consensus of those around me was that the Allagash White from the Allagash Brewing Company in Portland, Maine, was tops. It was the first that we tasted, and I must admit that I was a bit stingy with the scoring, and the white beer with a complex spicy flavor of cloves did bring more to the table than most in its variety. Calagione's own Nodding Head's George's Fault, reminding me of a number of hit-or-miss visits to the Center City brewpub. The roster for the general tasting was promising, and the event moved into the Chinese rotunda. My first stop was to my favorite brewpub, Triumph Brewing Company. The Princeton and New Hope brewpub will be opening a location on Chestnut Street, and their offerings of a Vienna Lager, Bengal Gold IPA and Raspberry Wheat performed well. The Raspberry, with which I was not familiar, was light and fruity without being too sweet. Cherry Hill's Flying Fish, who I don't remember being there last year, had a table and was pouring their 10th Anniversary Imperial Espresso Porter. I had already tried a four-pack of the porter, which features a welcome smokiness, and my enjoyment of it was confirmed. A number of my friends agreed. The one thing that you can almost always bank upon is the presence of good, flavorful IPAs, a fact that I, a confessed Hop-Head, thoroughly enjoyed. Michael Jackson alluded to the quality of American IPAs (and of the quality of all American craft brewing) during his speech, and his opinion was supported by the selection during the general tasting. Legacy Brewing Company's Hoptimus Prime Double IPA, Triumph's Bengal Gold IPA, Hop Whallop from Victory Brewing Company-- home of my favorite beer, HopDevil -- and the Greer Beer IPA from Philadelphia's Home Sweet Homebrew were memorable examples of the flavorful variety first brewed to survive the trip from the British Isles to the colonials in India. But the star of the show for my money was the Cocoa Loco Triple Chocolate Stout from Arcadia Brewing Company in Battle Creek, Michigan. Stouts are usually a little too heavy for my liking, but the smoothness and lightness of Arcadia's brew was fantastic. I crossed the crowded room two or three times for the chocolaty, understated stout. Plus, the beer is brewed in Battle Creek, so I could certainly see myself pouring a bottle over my cereal -- what better way to start your day? Of course, the main problem with the general tasting is that you can really only taste a small portion of the beers available. Fortunately, attendees got good news about next year that will allow them to spread the tasting over a larger period of time: Philly Beer Week. For more on that, be sure to check out a full preview over at Seen Through a Glass. I was invited to participate in a radio segment today regarding the power of restaurant reviews on WHYY’s Radio Times hosted by Marty Moss-Coane. Recently, restaurants have been making news by fighting the critics who gave them unflattering reviews: the spat between Kobe Club owner Jeffrey Chodorow and New York Times reviewer Frank Bruni, an Ireland court’s verdict against a restaurant critic for libel (apparently one of the first of its kind), and of course the t-bone of contention between Chops Restaurant and Philly’s own Craig LaBan. Marty thought it would be fun to explore with me some of the general legal issues regarding libel as they pertain to restaurant reviews, so that’s what we did. For those interested in listening to the podcast, here are the links: MP3 and Real Player. The first caller was a little BENT-up about a review that HAMMERED his restaurant several years ago. Marty eventually PRIED out of him the POINT the critic had made in the review that ended up being too much for his restaurant to HANDLE: believe me, it’s a NAIL-biter. In retrospect, I think this was a prank caller. While nobody likes to be the target of such a prank, you've got to give the guy props for executing it without being caught in the act, which, presumably, is the goal. Well done, sir. Many thanks to Marty and her wonderful and talented staff for inviting me onto the show and for being so welcoming and gracious while I was there. Jason Wilson wrote a vivid and informative article about the Philadelphia BYOB scene, which appears in today’s Washington Post. (See “Philadelphia’s BYO Revolution”) (registration required). I'm quoted in this article as well. Jason even published my intuitive little BYOB tip in the sidebar: check the restaurant’s menu before you pick your wine and don’t be afraid to bring a variety of bottles. In today’s New York Times you’ll find an illuminating article by Adam Liptak about the lawsuit Chops filed against Craig LaBan. (See “Serving You Tonight Will Be Our Lawyer”) (registration required). Liptak puts some meat on the bone by placing the Chops lawsuit in context with other cases in the U.S. that have been litigated against restaurant critics, all of which have failed. Liptak covers the international angle as well; apparently such lawsuits are more successful in Ireland. You’ll also find a quote in there from yours truly. The year the grapes for this wine were harvested was an interesting year. Revolution in the Middle East led to an energy crisis, The Police’s Roxanne was making its way to No. 32 on the Billboard charts and the U.S. Mint introduced the Susan B. Anthony dollar. I was eight years old then, and all I cared about was Star Wars and pizza. A lot can change in 27 years. And wine can be a fun way to measure those changes if you have the right bottle. A good friend of mine is an antiques dealer, and in the not-too-distant past he picked up a few lots of mixed bottles of wine at an estate auction. From what I understand, the lots included an impressive collection Bordeaux. He had drunk almost all of the Bordeaux by the time I got the chance to see the wine, including a bottle of 1982 Chateau Lynch-Bages. He was watching the TV show Alias when someone on the show mentioned the ’82 Lynch-Bages, so he uncorked it. He didn’t know that 1982 is a legendary vintage for Bordeaux. He didn’t know that Lynch-Bages is a respectable Fifth Growth chateau or that Robert Parker rated its 1982 offering an impressive 94. For him it was more of an Alias experience than a Lynch-Bages experience—he just thought it was cool that he was drinking the same wine that was mentioned on his favorite TV show. When I met him to go through the remainder of his stash, I spied a 1979 Pichon-Lalande still left in the box, so I liberated it. You may recall the episode of the Sopranos in which Tony and Christopher heist several cases of wine. The wine they stole from the van was the ‘86 Pichon-Lalande, which Parker scored a 94 in 2003. 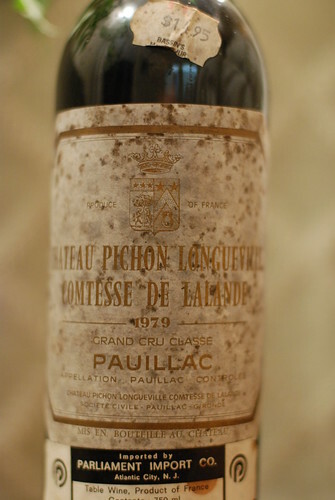 The ‘79 Pichon-Lalande, though, was no slouch—Parker includes it among his discussion of important ancient vintages for this chateau, calling it a “top-notch” effort and scoring it a 90. I didn’t have high hopes for this wine, to be honest. There was no information about how it was stored all these years. Plus, although Parker said it was “fully mature” and suggested it would last until the end of 2007, I had read elsewhere that it was past its prime. I knew I was in trouble as soon as I peeled the foil off the cap. Mold. 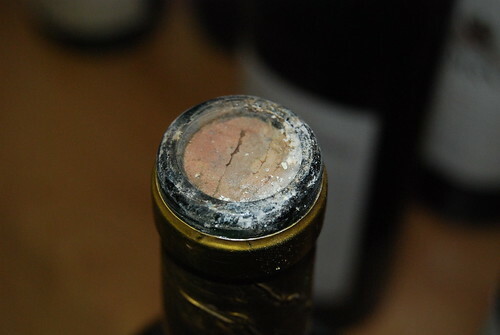 Further inspection revealed that the top of the cork was also wet. It only got worse. 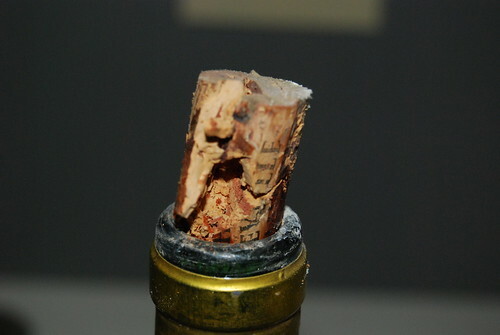 As the cork was about half-way out of the bottle, it started to crumble and tear in half. At this point, I pretty much knew it was over. Still, I removed the rest of the cork, wiped the mold off the lip of the bottle, poured the wine and let it breathe. While I waited, I tilted the glass and held it above the white counter-top. 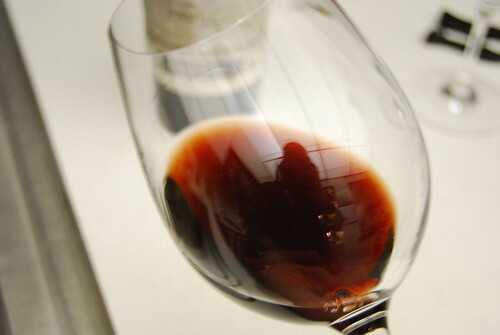 The wine had that signature brown hue at the edge that you only see with older clarets. It was beautiful. I soaked up as much of the color as I could, realizing that this would probably be the only rewarding part of the experience. Eventually, I swirled the glass, drew it up to my nose and took a deep whiff. I could identify the smell immediately; it was unmistakable. But even factoring-in my low expectations, it was heartbreaking: feces and disinfectant. After a while the smell mellowed into that of a wet basement. And that’s where it stayed, even into the next day. The subtleties of lush fruit and soft tannins the wine was supposed to reveal were nowhere to be found. All that was left on the palate was vinegary acid and the feeble hint of black currant—a faded echo of what this wine perhaps once was or what it could have been. Tainted or not, the one thing this wine delivers is perspective about how far we have come in a quarter of a century. These days, a crisis in the Middle East is affecting the cost of energy, The Police just played Roxanne at the Grammys and the U.S. Mint is trying to push a new dollar coin. Oh, how times have changed. I don’t know about you, but all of a sudden I’m the mood for Star Wars and pizza.